It seems completely obvious in retrospect, but it took a random interview with Mark Ruffalo to explain the likely reason why there's been no solo Hulk movie yet — it's Universal's fault. Now, Universal doesn't own the rights to the character of the Incredible Hulk, obviously; Marvel does, which is why he can appear in Avengers movies. But thanks to their partnership with Marvel on 2003's Hulk and 2008's Incredible Hulk movies, it appears Universal still has to be somewhat involved in all the Hulk-specific movies Marvel makes — which means they'd get a cut of the profits, too. Disney can't be too fond of that, and it makes spend that they'd rather spend their resources making Marvel movies where they collect all the earnings instead of dealing with the green goliath. 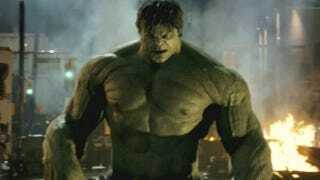 As far as a Hulk movie, a standalone Hulk movie, Marvel doesn’t really have the rights to that yet. That’s still Universal’s property, so there’s that issue. That’s a big impediment to moving forward with that. Now I don’t think that’s insurmountable, by the way, but I don’t know where it’s going from here for me. But at least now we know!